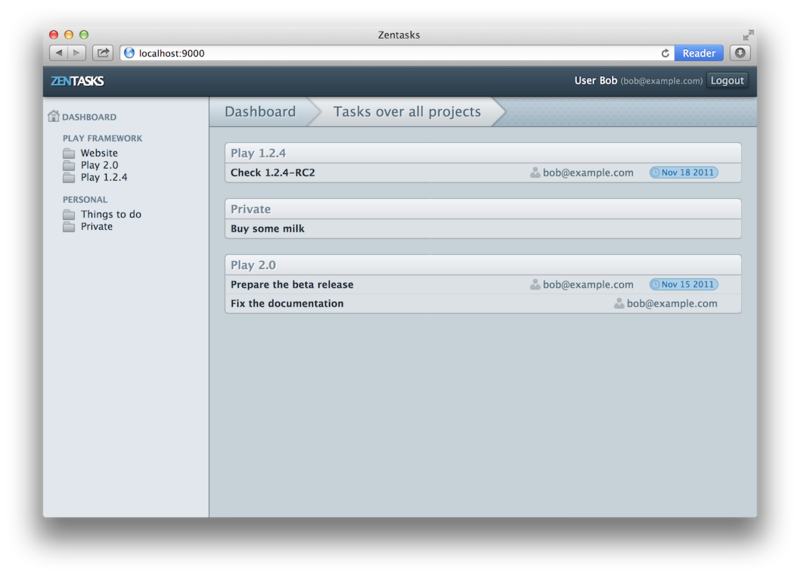 We can now display a dashboard. But before we can go on to allow users to create, work on and assign tasks, we need a way for users to identify themselves. Now visit http://localhost:9000/login in your browser to check that our route is working. Apart from the title, the page should be blank. Our login page needs to contain a form, which will of course, hold an email address (username) and password. The important thing to notice here is the @helper.form call. We have passed to it a route, routes.Application.authenticate. This tells Play where this form should be submitted to. Notice that there are no hard coded URLs here? This means we can change our URL structure without silently breaking our application. Play actually offers a much richer set of form tags, but they are overkill for our login form. We will look at those later in the tutorial. Currently, our authenticate action is doing nothing but reading our form. The next thing we want to do is validate the form. There is only one thing we are concerned with in the validation - is the username and password correct? To implement this validation, we are going to write a validate() method on the Login class in app/controllers/Application.java. As you can see, this method is able to do any arbitrary validation, in our case, using the User.authenticate() method that we’ve already implemented. If validation fails, it returns a String with the error message; otherwise, null if validation passes. This code introduces a number of new concepts. Firstly, if validation fails, we return a status of 400 Bad Request, rendering the login page with our form that had the failed validation. By passing this form back, we can extract any validation errors from the form, and the values the user entered, and render them back to the user. If the validation was successful, then we put an attribute into the session. We call this attribute email, and it’s value is the email address of the user that just successfully logged in. We will use this session attribute later to find out the currently logged in user. After setting the user in the session, we issue an HTTP redirect to the dashboard. You can see that we’ve used the reverse router, in the same way that we include assets in templates, to refer to the dashboard action. Now reenter the valid password (secret), and login. You should be taken to the dashboard. Notice that this time we’ve passed a fakeGlobal() to the fake application when we set it up. In fact, since creating our “real” Global.java, the ModelsTest we wrote earlier has been broken because it is loading the initial data when the test starts. So, it too should be updated to use fakeGlobal(). There are a few new concepts introduced here. The first is the use of Play’s “ref” reverse router. This allows us to get a reference to an action, which we then pass to callAction() to invoke. In our case, we’ve got a reference to the Application.authenticate action. We are also creating a fake request. We are giving this a form body with the email and password to authenticate with. Finally, we are using the status() and session() helper methods to get the status and the session of the result. We ensure that the successful login occurred with Bob’s email address being added to the session. There are other helper methods available to get access to other parts of the result, such as the headers and the body. You might wonder why we can’t just directly get the result. The reason for this is that the result may, for example, be asynchronous, and so Play needs to unwrap it if necessary in order to access it. Run this test to ensure it passes. Now that we are able to login, we can start protecting actions with authentication. Play allows us to do this using action composition. Action composition is the ability to compose multiple actions together in a chain. Each action can do something to the request before delegating to the next action, and can also modify the result. An action can also decide not to pass the request onto the next action, and instead generate the result itself. We have implemented two methods here. getUsername() is used to get the username of the current logged in user. In our case this is the email address, that we set in the email attribute in the session when the user logged in. If this method returns a value, then the authenticator considers the user to be logged in, and lets the request proceed. If, however, the method returns null, then the authenticator will block the request, and instead invoke onUnathorized(), which we have implemented to redirect to our login screen. Run the tests to make sure that the authenticator works. 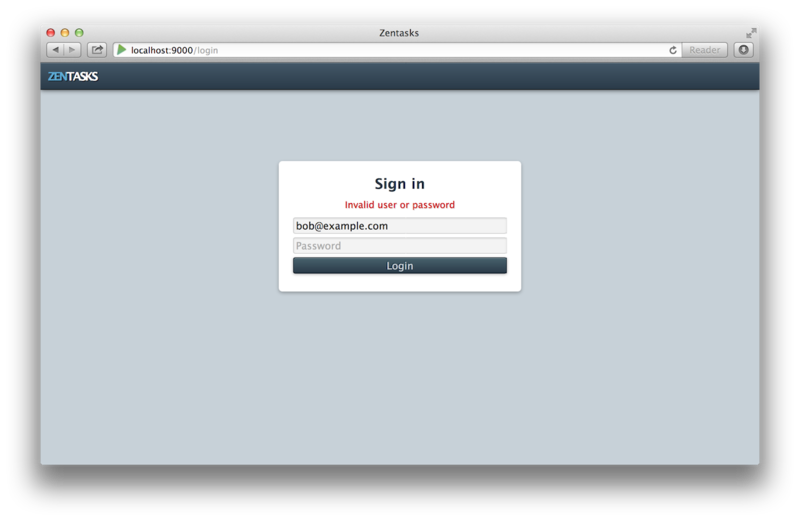 Now go to the dashboard in your browser, try logging out, and then visiting the dashboard again. You should be unable to view the dashboard; it will redirect to the login screen. Login, and you should be able to see the dashboard again. There is one last thing that we want to do. We can currently block access to an action based on whether we are logged in, but how can we access the currently logged in user? The answer is through the request.username() method. This will give us the email address of the current user. Let’s put the name of the user in the main template next to the logout link. To get the name, we’ll actually have to load the whole user from the database. Let’s also limit the projects to the one that the user is a member of, and the tasks to the ones that the user is assigned to, using the methods that we’ve already implemented on our models. Now visit the dashboard again, ensuring you are logged in. We can now see the currently logged in user, only the projects that the user has access to, and the tasks they have assigned to them. As always, commit your work to git.